It has been raining cuts and dogs here – some places in Europe even got flooded. What do you do on a rainy but still warm and summerish day? Well, I keep sipping tea of mountain herbs with buckwheat honey, looking at the map with the summer holiday destinations (those not flooded yet) and craving for a well-cooked comfort dinner. Well-cooked and comfort and dinner for me is a creamy risotto. Sometime ago inspired by 101 Cookbooks I was experimenting with spinach pesto: I found that spinach is fabulous in the combination with dry almonds and cream, but I though this pesto was little dull with pasta. It has proved though to marry happily to the risotto concept and here is the recipe I came up with. I love this risotto with spinach and almond pesto for it is a filling well-cooked dish that yet has the notes of summer flavor and lightness. So much for the comfort dinner for a raining summer evening – now, rain go away! 1. Set rice for cooking: pre-heat a sauté pan and then oil it with 2 tbsp olive oil. Add the chopped onions and simmer on a low flame until golden. 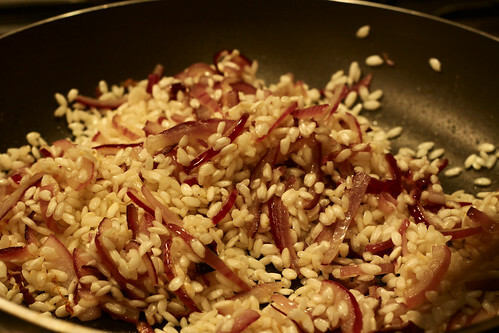 Add rice to the pan and mix it with onions so that al the grains are fully covered with oil. Simmer for a 2-3 minutes. Now add 1/3 glass vegetable stock, stir to distribute the liquid evenly and let simmer. As the liquid boils away add 1/3 glass of vegetable stock again. Continue in this fashion making sure you add enough liquid and the rice does not stick to the pan yet it is not fully covered with liquid either. It takes about 15-20 minutes to get the rice into a creamy yet al dente condition. Once done add a bit of saffron, Parmesan cheese and sprinkle some olive oil, cover with a lead and set aside for a bit. 2. Prepare spinach and almond pesto (can start this in the breaks from attending the rice – perfect for improving your multi-tasking): Pre-heat a sauté pan and oil it. Put chopped spinach in and cook for 3-5 minutes on a low flame stirring now and then. 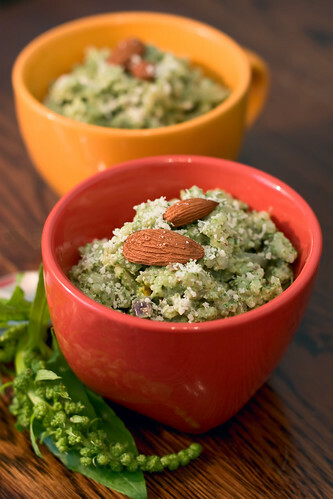 Transfer the cooked spinach into a tall plastic bowl, add almonds and make into a paste with a blender, add cream and continue blending into a homogeneous creamy paste. Add spices and salt. 3. Get ready for serving: Add the creamy spinach and almond paste to the risotto and stir. Add Parmesan when serving.